Valkyrie is a full-featured Layer 2-3 stateless traffic generator and analysis platform. It is used to configure and generate Ethernet traffic up at all speeds up to 400GE, and analyze how network devices and services perform in response, making it perfect for most lab-based data-plane test scenarios. Valkyrie offers a choice of two chassis that can be equipped with an extensive range of copper and optical Gigabit Ethernet test modules supporting all Ethernet speeds up to 400GE, including 2.5GE, 5GE, 25GE and 50GE. The chassis and test modules are controlled via ValkyrieManager, a Windows GUI client provided for ad-hoc test execution, and remote management of test equipment located in multiple locations. Also included are standalone applications for automated RFC 2544, Y.1564, RFC 2889 and RFC 3918 testing. Finally, an open TCP/IP-based text API lets users automate testing from any software environment, using Tcl, Python, Perl, VBA and Java wrappers to convert to/from the generic Xena Command Line Interface (CLI) format. Valkyrie is used by hundreds of customers worldwide who value its range of features, ease-of-use, cost efficiency, interoperability, and scalability. 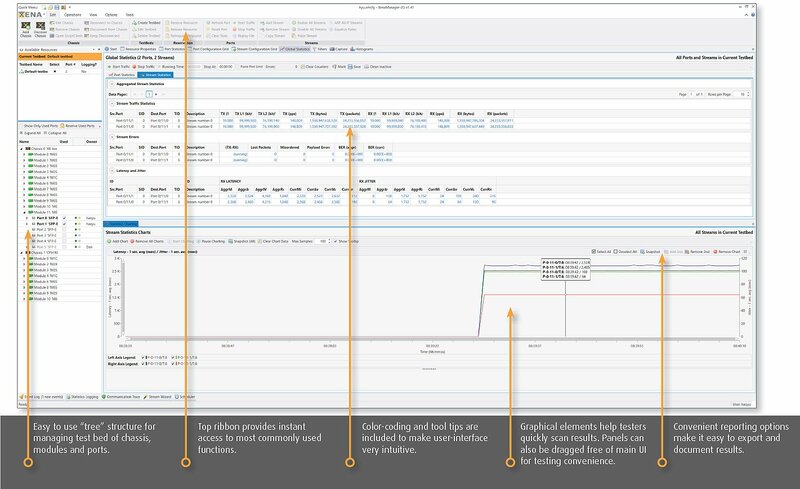 Valkyrie can handle the widest range of lab-based test scenarios – performance testing, functional testing, QoS and so on – with a minimum of fuss. Valkyrie reflects its Scandinavian roots – a quality product loaded with smart “no-fuss” features that delivers great value, from a company that sincerely cares about customer satisfaction. 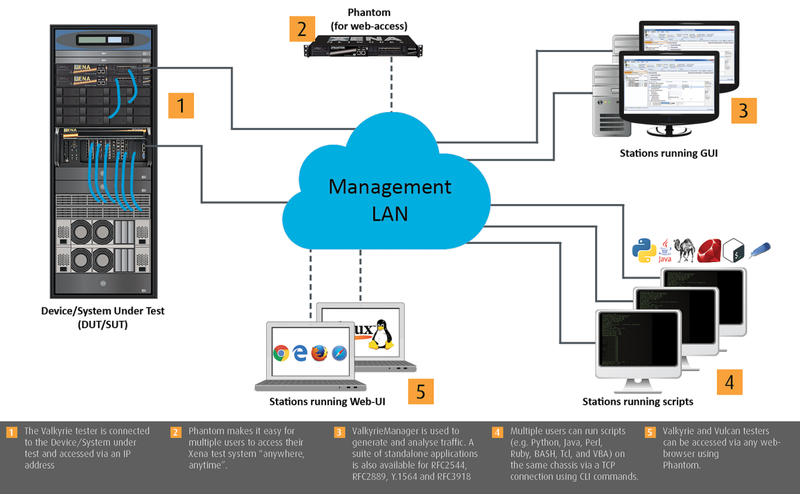 ValkyrieManager is a Windows-based application used to configure and generate streams of Ethernet traffic between Xena test equipment and devices under test (DUTs) at all speeds up 400Gbps, and then analyze the results. This is the software you’ll use most of the time. 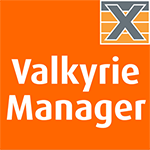 Below you can see some of the features of the ValkyrieManager UI. 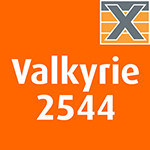 Valkyrie2544 fully supports the 4 test-types specified in RFC2544. There are extensive configuration options, support for single stream and multi-stream testing and you can define protocol layers supported by the test (Ethernet, Customer and Service VLANs, IP and UDP) precisely the way you want. Valkyrie2889 lets you accurately benchmark the performance of Layer 2 LAN switches according to RFC 2889 tests incl. all throughput and forwarding rate tests, congestion control, address caching capacity, address learning rate, broadcast frame forwarding and latency, forward pressure and maximum forwarding rate. 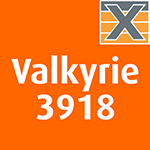 Valkyrie3918 makes it easy to do advanced IP multicast network testing using various framesizes, either as in-test variations or as multiple testruns each using a fixed frame size. Unicast and multicast traffic can be configured to use the exact protocol headers needed. All fields in the protocol headers can be modified. Valkyrie1564 makes it easy to validate Ethernet service-level agreements (SLAs) in a single test per Y.1564. It supports multiple protocols per UNI (Ethernet, Customer and Service VLANs, MPLS, IPv4, IPv6, and UDP) and you can define Per-UNI or per-CoS bandwidth profiles, and specify CoS-to-DSCP mapping. ValkyrieCLI is a command-line-interface scripting API with hundreds of scriptable parameters to make test automation easier. Any client platform can be used (e.g. Tcl, Perl, Python, Java, Ruby and VBA). XenaScripting supports multiple concurrent scripting sessions by different users in different locations. 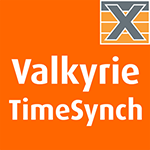 ValkyrieTimeSynch is a feature that enables multiple Xena testers to synchronize their local time to each other. This can be used for One-Way Latency (OWL) measurements between two test chassis, synchronized traffic start between multiple chassis and accurate timestamping of captured packets in exported PCAP files. Valkyrie includes a range of advanced Layer 2-3 test modules for testing all speeds from 1GE up to 400GE – and beyond. These test modules can be mounted in either of Xena’s hardware chassis – the easy-to-transport ValkyrieCompact (with one fixed slot), or the 4U ValkyrieBay which has 12 modular slots. The test modules support a variety of interfaces (SFP+, QSFP, CFP4, CXP etc.) and many are uniquely capable of handling multiple speeds via simple software settings. Xena offers test modules for all the Ethernet speeds up to 400GE. Click the speed you want to test to see our current range.